3/ REPORTER (beginning at 1:02:39): "A question for President, President Putin. Ah, two questions for you, sir. Can you tell me what President Trump may have indicated to you about officially recognizing Crimea as part of Russia? ..."
4/ "... And then secondly, sir, do you, does the Russian government have any compromising material on President Trump or his family?" 5/ PUTIN: "[chuckles] The posture of President Trump on Crimea is well known and he stands firmly by it, he continue to maintain that it was illegal to annex it. We - our viewpoint is different..."
6/ "... We held a referendum in strict compliance with the UN Charter and international legislation." 7/ "For us, this issue, we put [unintelligible] to this issue. Yeah, I did heard this rumors that we allegedly collected compromising material on Mr. Trump when he was visiting Moscow." 8/ "Our distinguished colleague, let me tell you this. When President Trump visited Moscow back then I didn't even know that he was in Moscow. I treat President Trump with utmost respect..."
9/ "...But back then, when he was a private individual, a businessman, nobody informed me that he was in Moscow." 10/ "But let's take St. Petersburg Economic Forum, for instance. There were over 500 American businessmen - the high ranking, the high-level ones, I don't even remember the last names of each and every one of them." 11/ "But, do you remember, do you think that we tried to collect compromising material on each and every single one of them? Well, it's difficult to imagine - an utter nonsense of a bigger scale than this." 12/ "Well, please just disregard these issues and don't think about this anymore again." 13/ TRUMP: "And, and I have to say if they had it, it would have been out long ago and if anybody watched Peter Strzok testify over the last couple of days and I was in Brussels watching it, it was a disgrace to the FBI, it was a disgrace to our country..."
14/ "... And you would say that was a total witch hunt. Thank you very much everybody. Thank you." 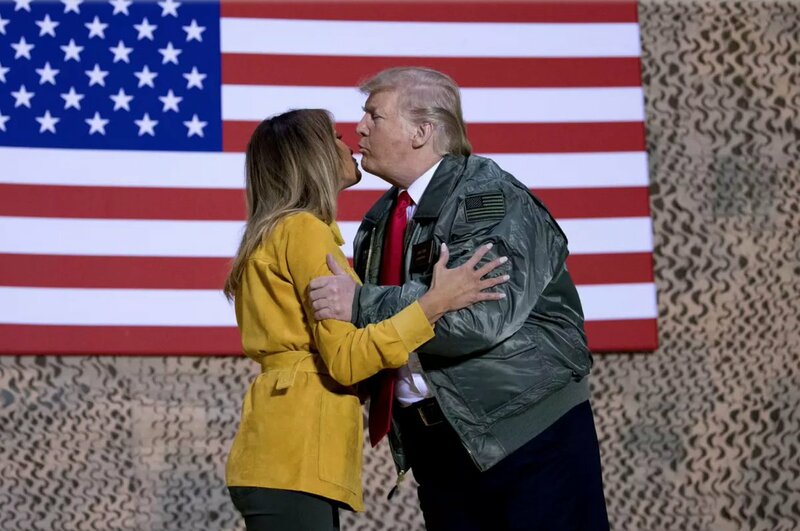 15/ Blushing with a suppressed smile alone would be enough - yet this set of nonverbal dynamics, clustered together in this context is PROFOUNDLY indicative of guilt. His blushing comes in a second wave precipitated by the Russian President's laughter/chuckling. 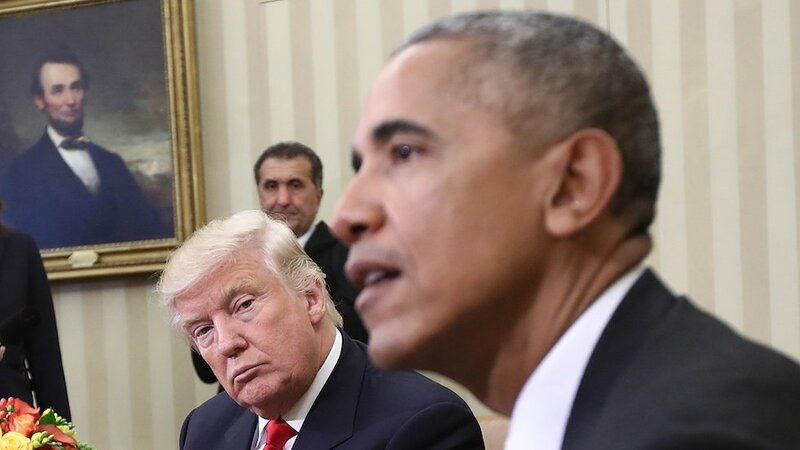 16/ Trump's "smile" in this moment is insincere - a pseudo-smile of bitterness (known specifically as a "Bitter Smile"). 17/ Crucially, although he eventually shakes his head side-to-side, the President initially nods his head up-and-down, signaling a subconscious "Yes" to the implication of blackmail. 18/ By closing his eyes, Trump exemplifies a blocking phenomenon - psychologically distancing himself from the words/ideas from which he feels the need to insulate himself. 19/ Human beings will tend to look down and to their right during moments of guilt, shame, and emotional weakness - and here Trump shows us an example of this tell. 20/ On cue, Donald Trump moves his arms and hands from a forward, wide-spread, position on the lectern - to a retracted, protective configuration - with them momentarily pulled into his mid-line at the back of the lectern. 21/ This is a form of a fig-leaf (aka Genital Guarding) and the change is strongly significant for a considerably alpha emotional tone - downshifting to one which is quite beta. Trump is feeling vulnerable in this moment. 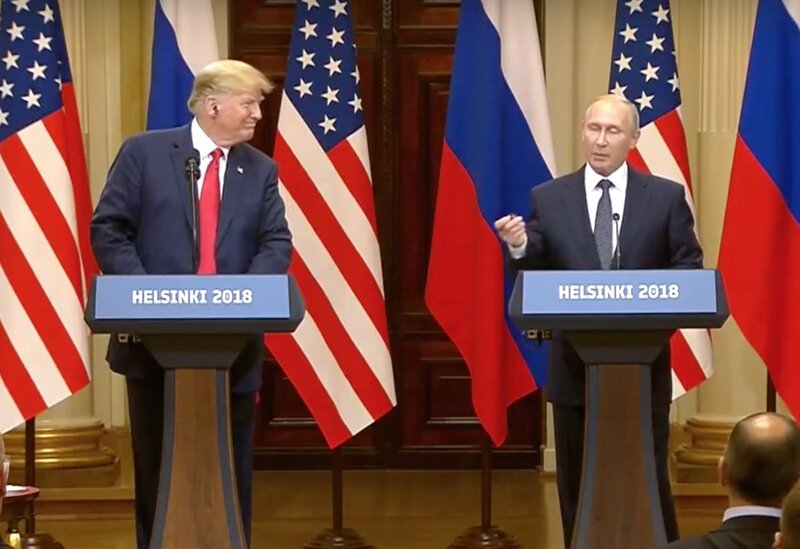 22/ Trump TWICE looks over at Putin - indicating his anticipation in the Russian's response. Trump is anxious. A person who is confident in their innocence would not have looked at Putin. Moreover, doing so makes him look like/indicates he feels as a subordinate to Putin. 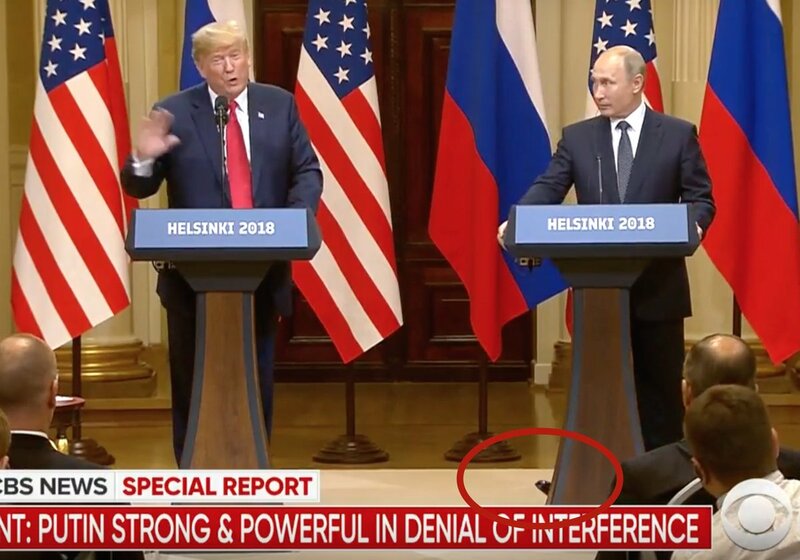 23/ Throughout most of the presser, Putin alternated between placing his legs a wide stance (more alpha) - back to one more narrowly spaced (more beta) - and then returning to a wider stance, etc. 24/ He continued this oscillatory behavior pattern throughout this portion of the exchange. 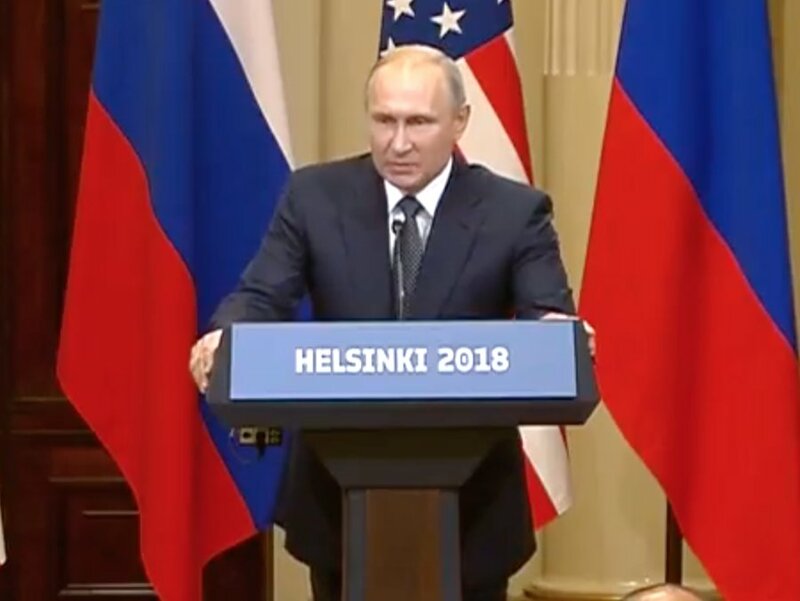 25/ When he began to speak about the St. Petersburg Economic Forum, however, his feet went back to a wider stance and he held the forward portion of the lectern, also leaning his torso forward. This change represents is a considerably more alpha pattern. 27/ ... it betrays his Freudian Slip/implication, that, although the Russian government couldn't get compromising material on them ALL - they did manage to get compromising material on SOME of the 500 American businessmen. 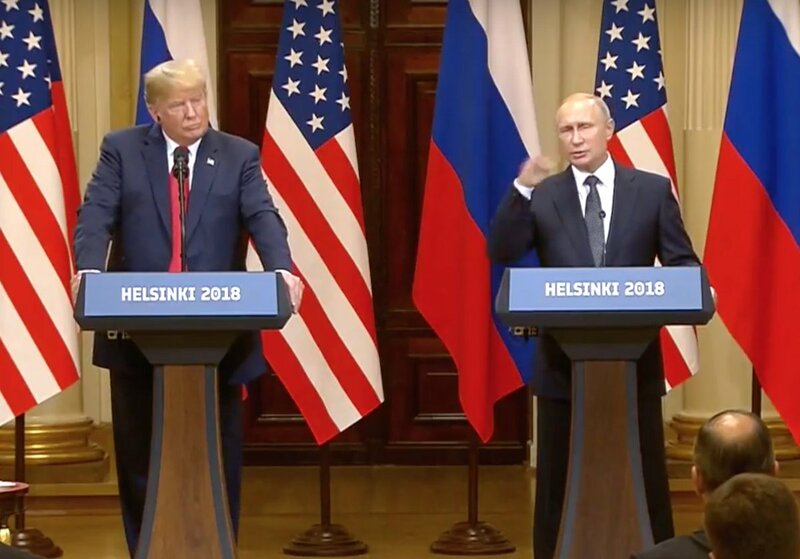 28/ During 1:03:39, as he says, "... compromising ...", Putin gestures using a palm-down, head/neck-level illustrator - akin to brushing away an insect, a pest. This is action is conscious and deliberate. 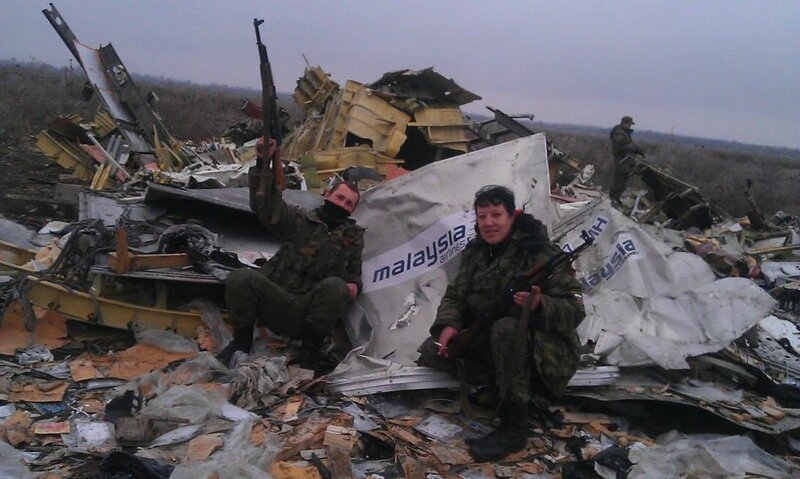 It is Putin in his theatrical mode, yet he's trying a bit too hard. 29/ It's pseudo-dismissive. This can be best encapsulated by the oft-quoted line from Hamlet (with apologies to Shakespeare), "The lady (gentleman) doth protest too much, methinks." 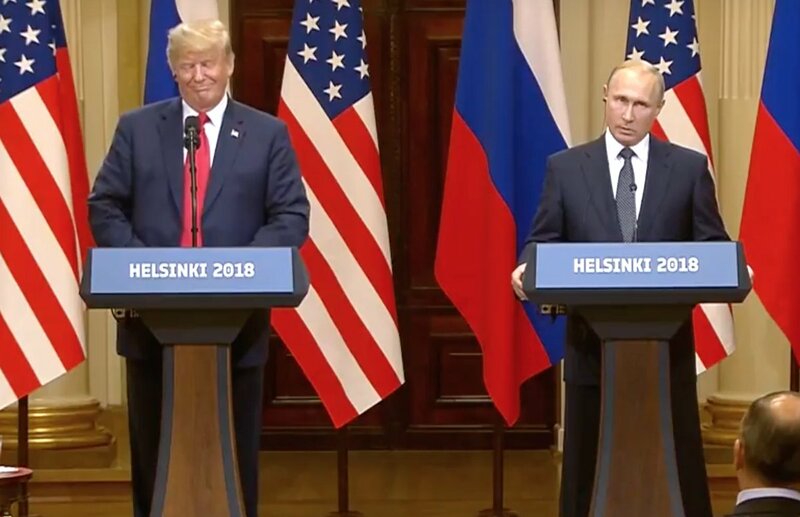 30/ Simultaneously with his pseudo-fly swatting, and at additional multiple times during his response, Putin also displays Rationalization Rapport Empathy Expressions (R2E2). 31/ This facial expression (a pseudo-disgust face) shows his desire/attempt to gain our rapport as co-rationalizers. When it's seen this frequently (or at crucial moments), the R2E2 expression is highly suspect for deception. 33/ ... Putin elevates the distal portion (toes) of his right foot - rocking back on his right heel. In this setting, this foot maneuver indicates a deception associated with a high-anxiety emotional state. 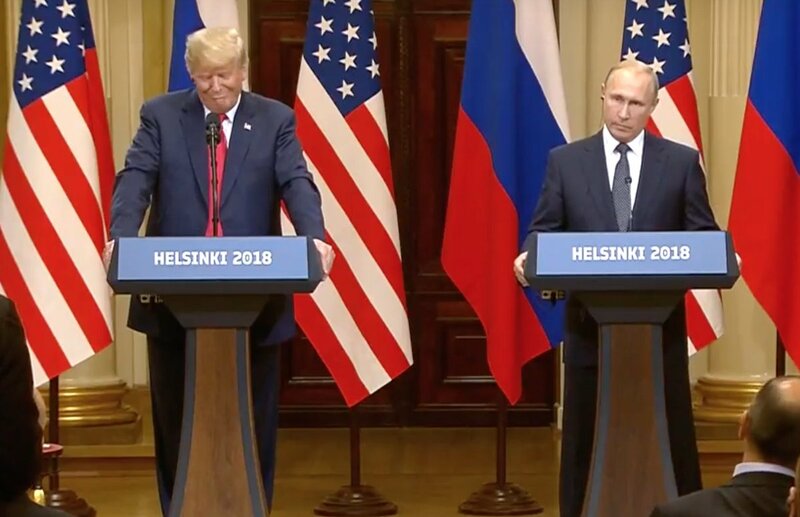 34/ During 1:04:41 - 1:04:42, as Trump says, "if they had it, it would have been out long ago", Putin again raises his right foot in this same manner. 35/ Of monumental importance is that Vladimir Putin never denied he had compromising material on Donald Trump. This is the statement analysis equivalent of red lights flashing and sirens blaring. 36/ Moreover, Trump's parting comment of "if they had it, it would have been out long ago" - is an example of an extremely common "even if" tactic associated with deception. 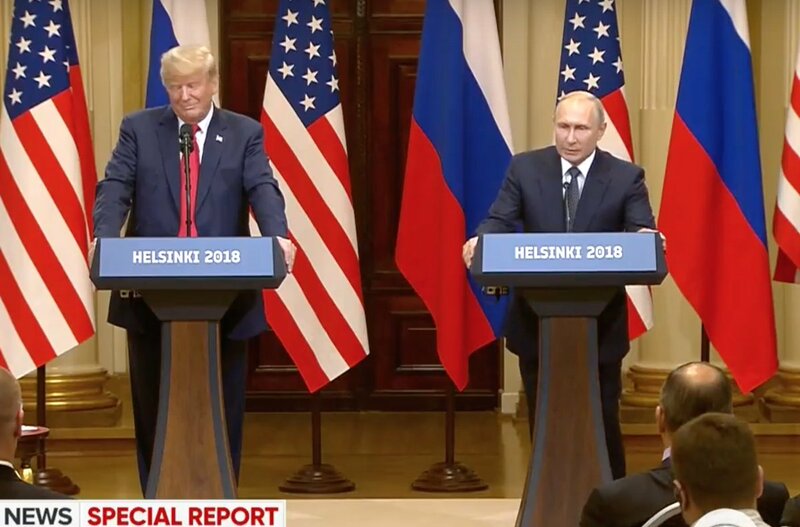 37/ SUMMARY: After detailed nonverbal analysis of this portion of the Trump-Putin press conference, the findings strongly support the allegation that the Russian government has "compromising material" (what the Russians call, "kompromat") on Donald Trump and/or his family. 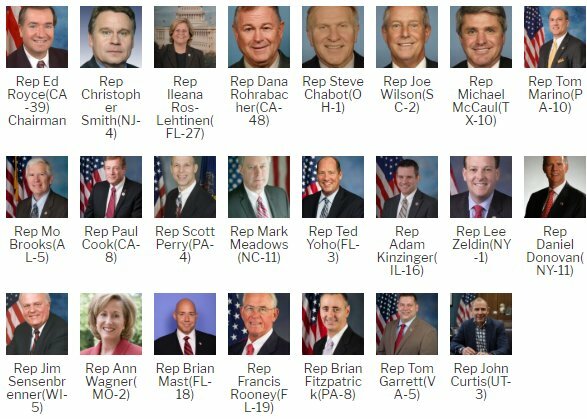 38/ Statement analysis also indicates both men are being deceptive. It's extremely probable that President Trump is being blackmailed. 1.Since 2005 #Russian Oligarchs have syphoned $335 Billion stolen money out of #Russia Putin himself is worth $200 Billion, and they are doing it using #Bitcoin, because its fast and effective, they use parts of it to interfere in elections. 2. One of the "henchmen" used by #Russia was Alexander Vinnick, who was arrested by @FBI laundering $4 Billion in dirty money through #Bitcoin.